Despite much Leftist indignation since Fukuyama declared the “End of History” 30 years ago, all current evidence suggests that History may, in fact, have run its course. The grip of neoliberalism today is substantially firmer than it was at the fall of the Soviet Union. Corporate capture of both the media and state enterprise ensures that the interests of concentrated private power are protected at the expense of the working class. Even the recurrent capitalist crises reinforce the status quo, as the powerful are best positioned to take advantage of economic catastrophe. In the decade since the collapse of Lehman Brothers, corporate profits have exploded while the ‘middle class’ is still worse off than it was in 2007, even as we are poised on the brink of another meltdown. Recent fretting about slow wage growth despite historically low unemployment and a sky-high stock market demonstrates the irrelevance of the traditional set of bourgeios econometrics. What does 3% GDP growth and a 26k DOW mean to the worker who struggles to meet basic healthcare, housing and nutritional needs despite a full-time job? Global economic liberalization, advances in technology, and the deliberate dismantling of organized labor have all stymied the bargaining power of the working class (for our purposes, if you must work to survive, you are working class). 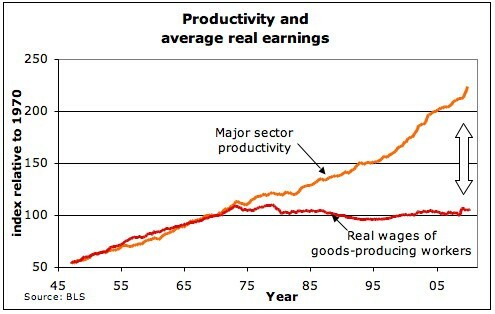 Real wages became uncoupled from productivity 40 years ago and have not since been rejoined. 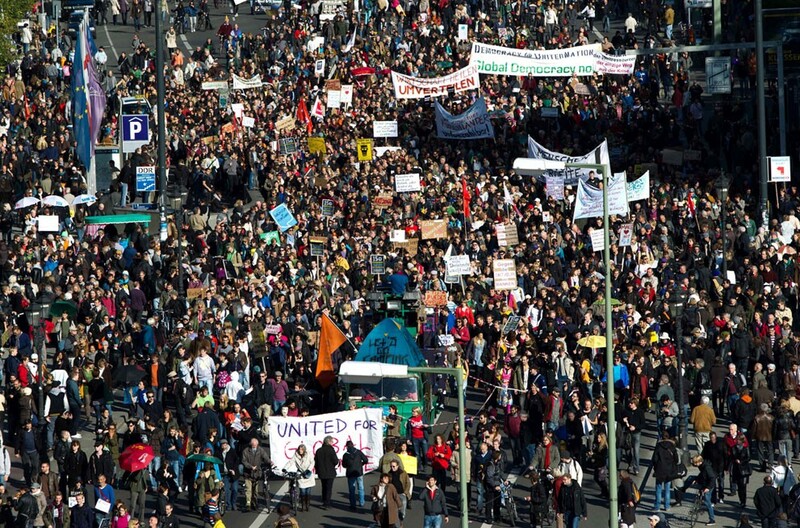 It is unsurprising that most Americans are alienated from the political process. Congress boasts an impressive 17% approval rating, and only about half of Americans have at least a “fair amount” of faith in the government to deal with either domestic or international problems. Perhaps this is because public opinion has virtually no impact on public policy, which is decided instead by a limited oligarchy. The supposed link between public opinion and successful legislation is purely incidental to the interests of the ruling (read: economic) elite. This pervasive, class-based disenfranchisement contributes to the United States’ notoriously bad voter turn-out and general political apathy from broad swaths of the American public. Where is the mythological democracy we claim to export to the illiberal world? Rather, the plutocratic character of American ‘democracy’ is only deepening as wealth inequality becomes more extreme. Citizens United (2010) institutionalized the already overwhelming role of money in politics on the fraudulent grounds that capital ought to be treated as an extension of constitutionally protected speech. This rejection of democratic ideals makes explicit the dominance of the ruling class over state power. The United States is now militarily engaged in Syria, Yemen, Somalia, Niger, Afghanistan, Iraq and Libya. Larger nations that dare seek self-determination apart from the American Empire are slapped with violent sanctions and tariffs. Cheered by the likes of the New York Times, the “successful” Iranian sanctions have avoided “both nasty consequences” of damaging the US economy through higher oil prices and failing to sufficiently undermine the Iranian regime. Naturally, the Times fails to mention that the sanctions also have the dual effect of ‘successfully’ inflicting severe hardship on Iranian citizens while vindicating the hawkish conservative clerics who criticized the moderate president Rouhani for engaging with the Americans in the first place. Other US terror campaigns, such as direct support for the internationally condemned Saudi bombings of Yemen, receive little media coverage until a flashy headline is too appealing to pass up. MSNBC reportedly ran 455 segments on Stormy Daniels from July 3, 2017 — July 3, 2018 while covering the US-backed campaign in Yemen exactly 0 times. In fact, it was not until the murder of one of their own elite in Jamal Khashoggi that that the Western press began to question the United States’ close ties to one of the most brutal and oppressive governments on earth. Media acquiescence in conjunction with the powerful incentives of the military-industrial complex have set up ideal conditions for permanent war. Consider the political upheaval across Europe caused by the resettlement of one relatively small middle-eastern country. What does the situation look like when whole continents become inhabitable? Climate change is an imminent threat to both global political stability and the survival of the species. What is the Left’s plan to confront these challenges? The Democratic Party, America’s nominally ‘left’ party, has absolutely no serious program to address the structural problems inherent to capitalism. Instead, Democrats pay lip-service to ‘equality’ while endorsing a highly reactionary pro-imperialist, pro-corporate agenda. Consider the laughable #Resistance movement against Donald Trump’s presidency popular amongst upper-middleclass liberals. There is not a single element of the anti-Trump liberal mania that substantially addresses any of the problems laid out in the first part of this essay. Rather, establishment liberals long for a return to “normality” and “civility” in politics. They look back fondly on 2008–2016 and opine that if only Obama were president again everything would be fine. As Noam Chomsky remarked in 2013, “I don’t usually admire Sarah Palin, but when she was making fun of this ‘hopey changey stuff’, she was right; there was nothing there”. Obama is the ideal presidential paradigm for American liberals. He is intelligent, composed and well-spoken. He says the right things about identity issues and makes vague complaints about those who don’t pay their “fair share” of taxes. Let us for a moment consider Obama’s record on three issues crucial to a left politics: Economy, foreign policy and the environment. A popular left-wing criticism of Obama’s handling of the post 2008 crisis economy is that he not only failed to jail the bankers responsible for the crash, but he in fact bailed out the financial sector with taxpayer dollars while over 7 million Americans lost their homes to foreclosure. What was to be done at the time, though? Had the government not enacted TARP and similar programs, the global economic meltdown would have destroyed civilization as we know it. Overnight elimination of huge amounts of fictitious wealth would result in mass homelessness, hunger, and death. Economic activity would come to a standstill. Under threat of this calamity, we were instead handed a managed crisis. Certainly, millions of people would lose their jobs, homes, and life savings. Those who live on the economic margins might lose their lives. But the system would persist. Indeed, in what sense did it really fail? It certainly did not fail for those in power. As noted previously, the managers of this system are wealthier today than they were in early 2007 in both absolute and relative terms. Financial players are still incentivized to manipulate risky financial instruments for profit. They are fully aware that when the market fails, their risks will be socialized onto the population because there is no alternative. Hence the expression “socialism for the rich, markets for the poor”. Obama’s great failure is that he did not question the fundamental assumptions of our economic system. He, like all American liberals, believes that the contradictions of capitalism can be regulated into submission. If only we passed enough Glass-Steagall and Dodd-Frank acts, we could ride Fukuyama’s Hegelian fantasy into the ideological sunset. But who writes these laws? Who will enforce them against the most powerful institutions on the planet? Who will uphold justice when these laws are breached? Corporate lobbyists write laws. They are signed by legislators whose campaigns are financed by the same corporations. Laws are enforced by executives who are more accountable to Goldman Sachs and Lockheed Martin than their constituents. Laws are interpreted by judges appointed by executives and confirmed by legislators. Obama’s cynical 2018 endorsement of Medicare for All, notwithstanding the overwhelming popularity of a public health insurance option in 2009, transparently demonstrates this disconnect between public will and public policy. To understand why Obama and the Democrats pushed through a right-wing healthcare reform package instead of the popular public option, simply look at how Obama’s campaign was financed. The parasitic relationship between corporate power and the state can never be resolved on power’s own terms. What of our liberal paragon’s foreign policy record? Obama vastly expanded the illegal and murderous drone program; responsible for the deaths of thousands of civilians and the creation of thousands more terrorists. In Syria, he supported fundamentalist Sunni rebels including the al-Nusra Front, an al-Qaeda affiliate, in a proxy war against the Russians and their alliance with Assad. This in turn led to the rejuvenation of Sunni extremist groups in the region and the rise of ISIS in Iraq and Syria. Obama continued support for the 17-year long war in Afghanistan despite no progress and no coherent end-state in mind. In Libya, he supported the UN coordinated ousting of Muammar Gaddafi, plunging the country into chaos and converting it into a breeding ground for brutal strongmen, extremists, and slave traders. As a mea culpa to Saudi Arabia for the Iran JCPOA, his one major foreign policy achievement, Obama agreed to provide military support for Saudi Arabia’s ongoing devastation of the Yemeni population. Interviewer: We have heard that half a million children have died. I mean, that’s more children than died in Hiroshima. And, you know, is the price worth it? Albright: I think this is a very hard choice, but the price — we think the price is worth it. This is a sociopath. 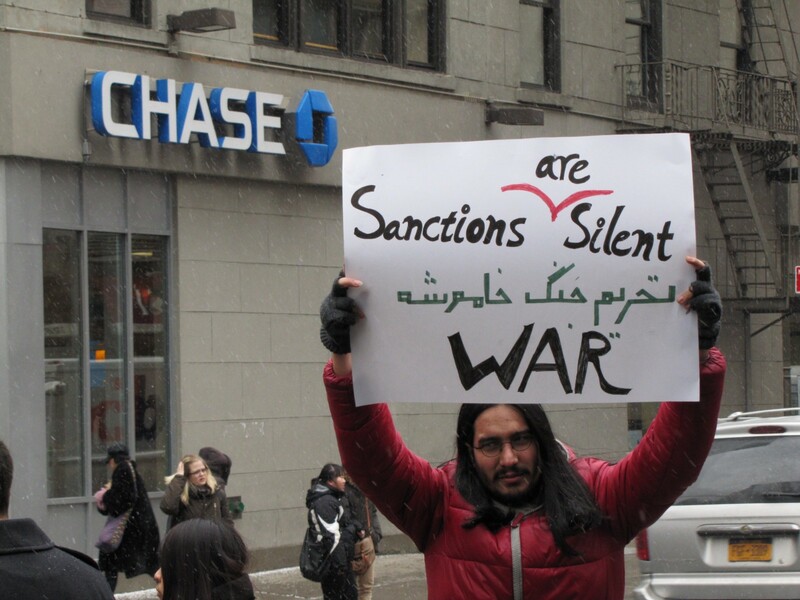 The United States was aware since 1992 that Saddam did not have weapons of mass destruction but kept sanctions in place in order to force regime change. 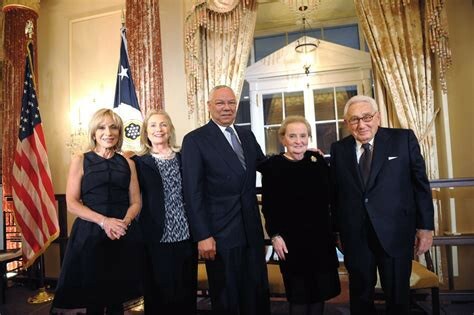 To Albright, removing Saddam was worth at least the lives of 500,000 children. One would expect such an individual to be universally despised and relegated to the dustbin of history. Instead, Albright was promoted to Secretary of State shortly after her comments in 1996 and has since served the liberal establishment in various capacities. She campaigned for both Hillary Clinton and Barrack Obama, and was awarded the Presidential Medal of Freedom by Obama in 2012. Albright now has a comfortable position at the liberal Brookings Institute think-tank and serves as the Mortara Distinguished Professor of Diplomacy at Georgetown University. The American liberal establishment has no serious foreign policy disagreement with the Republican party. Hillary Clinton’s 2016 presidential bid was endorsed by psychotic neocon and Iraq War II architect Paul Wolfowitz. At the New Hampshire University Democratic primary debate, Clinton bragged that Henry Kissinger had congratulated her for running the State Department “better than anybody had run it in a long time”. Even when Trump accidentally stumbles toward World peace, liberals and the media attack him from the right. Improving relations with one of the only major world nuclear powers and welcoming North Korea into the international fold should be a priority for the Left. Instead, paranoid liberals see a Russian conspiracy around every corner and hawkishly denounce even the mildest concessions in North Korean negotiations. One of the few times the media hailed Trump as “presidential” was when he hurled Tomahawk missiles at Syrian government forces after the latest false flag attack in Douma. There is no mainstream liberal opposition to the pro-war Washington consensus. Pathways limiting global warming to 1.5°C with no or limited overshoot would require rapid and far-reaching transitions in energy, land, urban and infrastructure (including transport and buildings), and industrial systems (high confidence). There is no plank in the Democratic Party platform I am aware of that would bring about the necessary changes prescribed by the IPCC report. To say nothing of the socialist alternative, Democrats are unwilling even to make radical pro-environmental proposals within the capitalist framework. Where is the concentrated push for massive investment in public transportation, alternative energy and efficient infrastructure? Where is the unity behind a proposal for a harsh carbon tax to hold energy companies to account for the destructive externalities they generate? At best, Hillary Clinton was vague on this issue in the 2016 general election and refused to make strong policy commitments for fear of angering corporate donors. As Secretary of State, she campaigned to increase fracking around the World through the Global Shale Gas initiative. By September 2016, Clinton had received over $776,000 in contributions from the Oil and Gas industry; outraising Trump by $270,000 in that sector. It is not enough to simply ‘believe’ in climate change, as was the thrust of Clinton’s 2016 climate plank. Mere belief has no effect on the parts per million of C02 in the atmosphere. Like her Party, Clinton falls woefully short of the strong positions needed to make even a dent in global warming. Perhaps the most frustrating aspect of the present political situation is that economically progressive policies tend to be deeply popular with the electorate. Overwhelmingly, Americans support free higher education, action on climate change, Medicare for All, infrastructure spending, and so on. Even more exasperating is that these proposals are supported by a broad cross-section of Trump’s core constituency. It is no surprise that Bernie Sanders, a relative unknown before 2016, has consistently ranked as most popular active politician since his presidential campaign. How, then, are we stuck with a right-wing autocrat who actively opposes policies that would benefit his most loyal supporters? The longer they talk about identity politics, I got ’em. I want them to talk about racism every day. If the left is focused on race and identity, and we go with economic nationalism, we can crush the Democrats. This dynamic has played out again and again since the last election cycle. In my view, the failure of the Democrats can be summed up by their full embrace of neoliberalism coupled with a veneer of social justice sympathies. These are perfect conditions for right-wing populists to take advantage of cultural and economic anxieties with false promises of a return to white American glory. It doesn’t matter that Democrats are correct about the structural obstacles faced by black, Hispanic, gay, trans, or disabled Americans. Building what Slovenian philosopher Slavoj Zizek called (I’m paraphrasing) a “rainbow coalition of Black Lives Matter, trans rights activists and Goldman Sachs” at a time when cultural and economic alienation are at all-time highs in a country that is still majority white and straight is a recipe for failure. Under these circumstances, it is child’s play for chauvinists like Trump to gin up the existential fear of alterity ever bubbling below the surface of white America. To borrow Derrida’s allusion to Capital, a spectre of Marx haunts still haunts the West. The failure of liberalism is directly responsible for the rise of right-wing nationalist movements across Europe and the Americas. From the German AfD, Hungarian Jobbik, French National Front and Greek Golden Dawn in Europe to Balsonaro and Trump in the Americas, workers are coalescing around fascistic ideology in the absence of a true Left alternative. Even the social democratic Sweden gave significant ground to the nazi-offshoot Sweden Democrats after years of creeping austerity. For the American Left, bold economic progressivism must be a starting point in the face of right-wing nationalism. There is no hope for the revolutionary change necessary to avert catastrophe if the working class is aligned with the Right. In the long run, mere progressivism will be insufficient. The insurgence of the Sweden Democrats is evidence that capital is both patient and persistent even in the most generous welfare state, and will assert its corrupting influence in time. 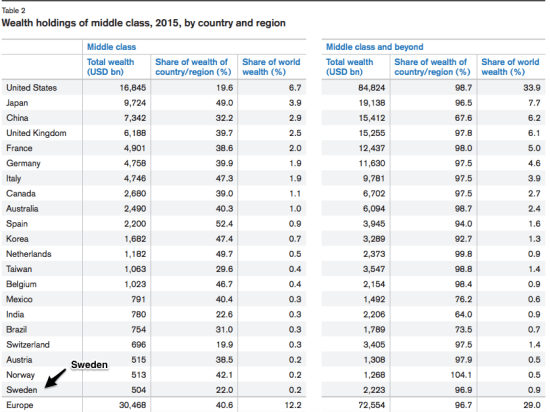 Sweden’s wealth inequality goes largely unnoticed due to the excellent standard of living it currently ensures for its citizens. Despite the present success of the Nordic model, it would be a mistake to believe that politics is done. The gains made in Scandinavia must be constantly expanded and defended against the corrosion of moneyed interests. Ultimately, capitalism must be replaced with a system of worker control where workers reap the full value of their work. Grassroots socialism and workplace democracy are the only true antidote to the ravages of capitalism because they return power to the hands of the working class rather than their capitalist owners. Likewise, political democracy can only function fully when power is distributed among the citizens of a state rather than concentrated in the upper echelon of private interest. There isn’t space in this essay to outline a theory for libertarian socialism in the 21st century, and the task at hand for the American Left is still much more conservative. It does not take a Marxist critique of political economy to see that free healthcare, education and climate stability are popular social goods. Rather, solidarity with members of a group is one of the most basic human instincts, and the working class is the largest group in America. This is not to say the Left ought to ignore the way race, gender and ability intersect with class (black labor unions were created for a reason), but class must once again be the centerpiece of the Left’s political project. That History is likely over smacks of some irony, as the end of ideology is poised to take us all with it. It remains to be seen whether humanity will choke on the dust of a dying planet or whither under the shadow of a mushroom cloud. Or, perhaps, we will realize our better nature in a final desperate gasp and take back control of our material condition. It has fallen to the Left to find humanity’s way out of certain annihilation, but the Left must first find itself.